(Modesto, CA) – The Human Services Program at Modesto Junior College is sponsoring a presentation by Joslyn Gaines-Vanderpool entitled, “Live Now! The Power of Being You! Brave, Bold, and Beautiful” on Thursday, October 4, at 5:30 p.m. in Forum 102 on East Campus, 435 College Avenue, Modesto. A well-known motivational speaker, author, editor, entrepreneur, and educational and empowerment specialist, Gaines-Vanderpool is the second and final presenter in a two-part series titled “An Evening of Brilliance and Insight.” The public is invited to participate in this free event. Gaines-Vanderpool has served as the principal researcher for two educational documentaries: “Beyond the Dream I” and “Beyond the Dream II.” She worked at Howard University’s Urban Affairs Institute and University of New Mexico, and currently is the outreach specialist at American River College, where she has helped numerous students attain scholarships ranging from $200 to over $200,000. She empowers students through scholarship seminars to find their voice, tell their stories and thrive. Passionate about assisting others to realize their dreams and acknowledge their beauty, strength and worth, she urges all to live in a positive light and be mindful of how their humanity and capacity to love can break through racism and other societal ills. 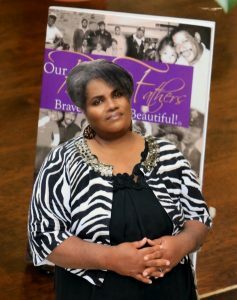 Gaines-Vanderpool, along with her publishing partner, Anita McGee-Royston, is the editor and co-creator/founder of the Brave, Bold and Beautiful Book Series, and has completed two anthologies: “Our Black Fathers, Brave, Bold and Beautiful!” and “Our Black Mothers, Brave, Bold and Beautiful!” The mission of these publications is to change the negative portrayals and disheartening narratives of men and women of African descent, and present their truth in books designed to bring racial harmony, healing and honor to their legacies and hidden histories. The books have been used and/or presented at the University of Nevada, Reno, Fathers and Families Conferences in San Francisco and Los Angeles, the Sacramento County Office of Education, Allensworth Celebrations, University of California, Davis 1st Annual Summit on Racial Equity and Social Justice and more. Known also as a “human whisperer,” Gaines-Vanderpool is a mid-century African American woman with a heart for the soul. She is a published poet, who also has memoirs, plays, empowerment and children’s books in progress. Believing that all individuals from every stratum of life have a story, she encourages everyone to begin the process of leaving an intentional legacy so others know that you existed and made a positive and impactful contribution to the planet. For more information contact Tasha Williams, MJC Human Services Program Mentor at williamsta@mjc.edu or (209) 548-5742. Tasha is a true "Multipotentialite" in every sense of the word! Not only is she a freelance writer, but she also sings, acts, attends MJC full-time, pursuing her degree in Human Services, while single-handedly raising two teenagers, a son, Giovanni (16), and a daughter, Aciemarie (14). Find her on both Facebook and LinkedIn here: www.facebook.com/tasha.smiles.daily, www.linkedin.com/in/tashaalwayssmiles.